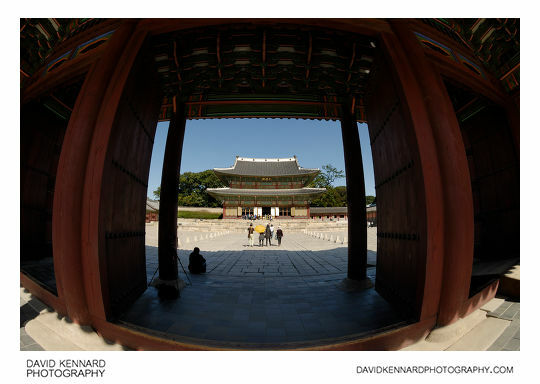 Looking through Injeongmun gate, you can see Injeongjeon, the throne hall of Changdeokgung. 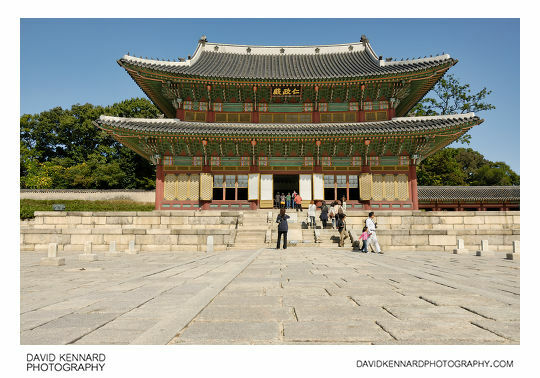 Although it was a self guided tour day, there were still some tour groups looking round the palace. 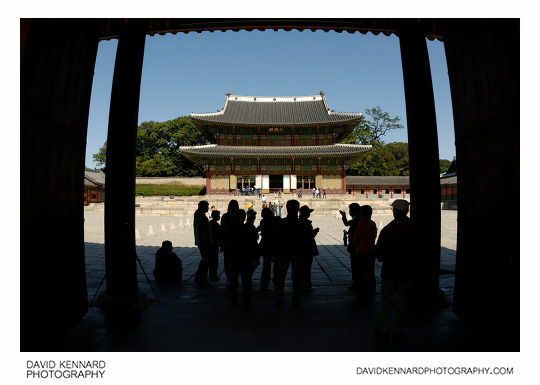 You can see a group here silhouetted in the shadow of Injeongmun. 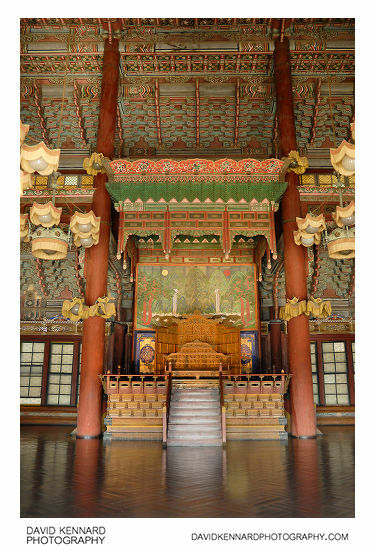 Although Injeongjeon (Hangeul: 인정전 Hanja: 仁政殿) appears to be a two storied building from outside, it is actually a single storey building with a high roof. It would be used mainly for official ceremonies such as coronations and receiving foreign ambassadors. The Japanese devised cunning strategies to snub the Joseon Dynasty and blunt Korean pride. An example is this plum motif, which can be found on the roofs of Injeongjeon and Injeongmun Gate. The Chinese characters for 'plum' are 李花. 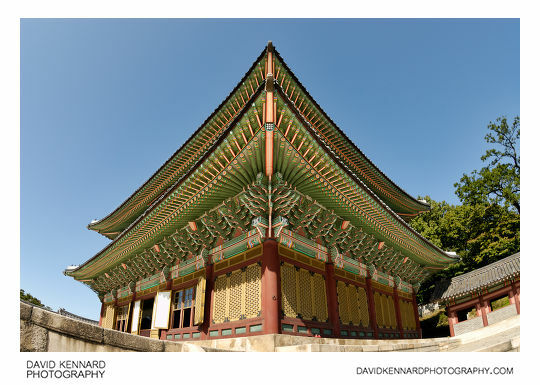 The surname of the founder of the Joseon Dynasty is 李, pronounced Yi, same as the first syllable of plum in Chinese. The Japanese sought to downgrade the Joseon Synasty to a clan society of the Yi family under the Japanese Emperor. That is why the Japanese referred to Korea as the Yi Dynasty, not Joseon. 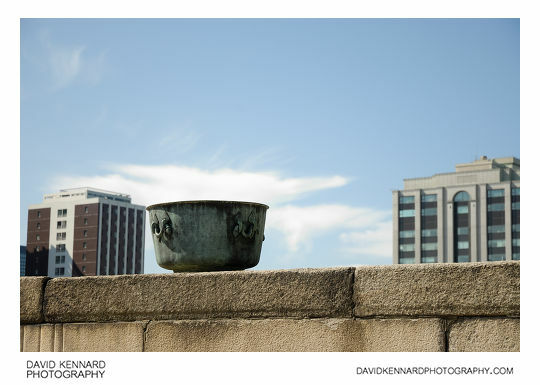 On the raised stone platform that Injeongjeon is built on, there are large bowls on either side. These are called Deumeu (Hangeul: 드므) and were used for fire prevention. However, they weren't really large enough to pull much water from if there was a fire, rather they were meant to scare away fire demons. The idea was that the fire demon (they seem to be referred to as Bulgwisin (Hangeul: 불귀신; Hanja: 火歸神) and Hwama (Hangeul: 화마; Hanja: 火魔)) would look into the water and then be frightened off by its own reflection. Looking up at the roof of Injeongjeon from below you can appreciate the brightly painted woodwork of the eaves. The current building dates from 1804, after it was burned down in 1803. Next we went through a gate to the east, towards Seonjeongjeon and Huijeongdang.